Reconstruction one year later of the assassination of liberal leader Rafael Uribe Uribe; with the participation of the perpetrators: Messrs Galarza and Carvajal. A Colombian dancer teaches a Spanish doctor how to dance salsa. 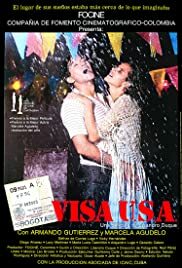 A warm and amusing portrait of small-town (and also big-city) life in contemporary Colombia, `Visa USA' tells the story of Adolpho (played with great charm by 80's heartthrob Armando Gutiérrez), a DJ that works in a supermarket in Sevilla, in the western Colombian province of Valle del Cauca, and his misadventures to obtain a much coveted visa that will allow him to emigrate to the US. With a great supporting cast (fans of Marcela Agudelo can see one of her first on-screen appearances, here as Adolpho's down-to-earth girlfriend), `Visa USA' stands out as a fresh and sincere film on Colombia's every day life.